Delivery of caps and gowns signals the end of the fall semester at Paris Junior College, as does an increase in the number of students studying for next week’s final exams. 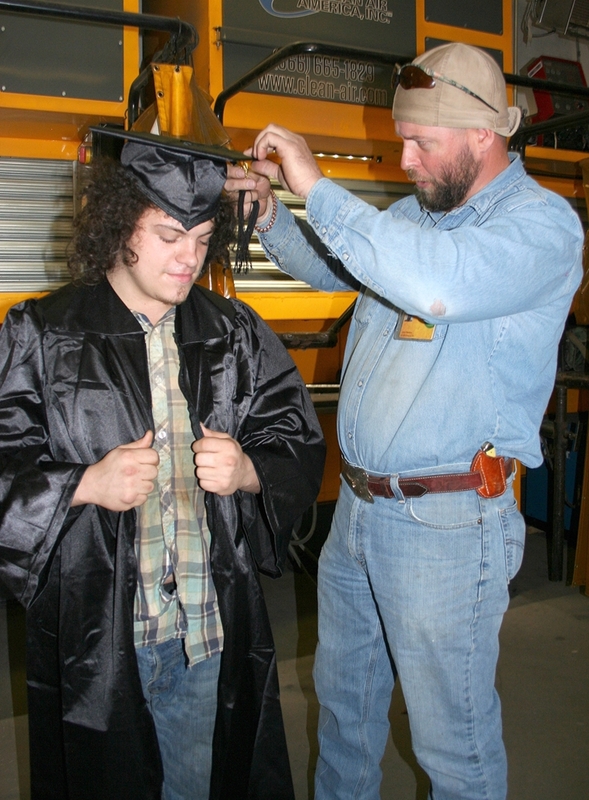 GRADUATION TIME PJC-Sulphur Springs Center student Dylin Gosart gets assistance from welding instructor John Plemons as he tries on a graduation robe to ensure a correct fit as he prepares for fall graduation ceremonies. Gosart, of Sulphur Springs, is completing his certificate in the welding program. Fall graduation will be held in the PJC Hunt Center in Paris at 7 p.m. on Friday, Dec. 15. The fall graduation ceremony will be held at 7 p.m. in the Hunt Athletic Center in Paris on Friday, Dec. 15. Students should arrive at the Rheudasil Learning Center by 6 p.m.
Family and friends are encouraged to arrive early to find seating in the Hunt Center. They are also invited to join graduates in a reception afterwards in the McLemore Student Center Ballroom. As the fall semester winds down, registration continues for both the Winter Mini-Term and the Spring 2018 Semester and will continue until PJC closes for Winter Break at 5:00 p.m. on Dec. 15. Spring registration will resume when PJC reopens on Jan. 2, 2018. The 16-week semester will continue until May 11, 2018. A flex term will also offer 8-week courses that begin on March 19 and end May 11. To learn more about graduation or registration, contact the Office of Admissions and Records at 903-782-0425.